In a very remote and sparsely inhabited area of Pernem lies a small, charming and abandoned Sawantwadi fort. It is an exceptionally scenic location overlooking a peaceful river. This was not always the case as a ferocious battle between Sawantwadi and Portuguese forces was waged here in 1746. Upon becoming Viceroy on September 22, 1744, Dom Pedro Miguel de Almeida e Portugal, Conde de Assumar and Marquez de Castello-Novo, resumed the campaign waged by his predecessor, Dom Luiz de Menezes, against the Sawantwadis. One of his first aims was to capture the Sawantwadi fort at Alorna, which in his words, was one of the ‘enemy’s greatest strongholds’. Its capture would open up the Sawantwadi territories north of Goa to conquest and help consolidate Portuguese rule over Goa. Accordingly, on May 4, 1746, a large formation comprising one company of sharpshooters, six companies of grenadiers, seventeen of light infantry, 150 artillerymen and 80 cavalry, converged on Revora. These 5000 troops were under the command of an adventurous Frenchmen, working in the service of the Portuguese, Colonel Louis Pierripont. From Revora, the troops marched for ten hours right into Sawantwadi territory, in the direction of Alorna. Meanwhile, Dom Predro Miguel, sailed on board a ship accompanied by twenty six other ships, through the Chapora river to Alorna. The troops, marching at the height of the stifling summer heat, suffered the most, especially as there were not enough animals, carts and wagons to carry the necessary military supplies and equipment. They found themselves having to carry nearly everything on their own. In such circumstances, they arrived in the Alorna area severely exhausted. Colonel Pierripont had been instructed to meet the Viceroy’s armada at a secretly prearranged location near Alorna so that a land and naval attack could be simultaneously launched. Despite the condition of the troops, it was decided to launch the attack without further delay. The five hour battle began with the grenadier companies launching a flank attack on the trenches around Alorna. This proved very effective and losses were minimal: one killed and seven wounded. At 3.00 a.m. an explosion went off at the entrance gate to the town. This signaled the start of the main attack. By now, the Sawantwadis were more than ready and opened fire with their muskets. The losses were devastating. Within seconds, dozens lay strewn on the ground. As more assailants leapt forward, the Swantwadis responded with more gunfire. It was not long before hundreds were killed. With each Portuguese charge, the Sawantwadis simply reloaded their muskets. Nevertheless, Colonel Pierripont encouraged his troops to keep on charging, inching closer and closer to the Sawantwadis. He himself felt the effects of Sawantwadi gunfire, but although badly wounded, he continued urging his troops to move forwards. Under such circumstances, Sawantwadi defenses eventually gave way. Nevertheless, the battle was only half won, as the fort itself was still in Sawantwadi hands. Realizing this, the Viceroy ordered an attack with ‘redoubled vigor’ following a defiant refusal by the garrison to surrender. This time the assault was even more deadly, resulting in absolute carnage. It was not hundreds, but thousands, who were killed. Sometimes it was purely accidental. ‘Our grenades rolled back off the tiles on to our heads doing incalculable havoc’, complained the Viceroy. It seemed nothing could be done to penetrate the outer defenses. To make matters worse, practically all the officers were killed. The troops quickly showed signs of confusion. The Sawantwadis, meanwhile, prepared to turn their canons on them. Realizing that the battle might end in a disaster, the Portuguese decided to do something urgently. Their focus now was on the main gate. Sergeant-Major, Pedro Vicente Vidal, succeeded in reaching the gate in the midst of heavy enemy fire and igniting an explosion which blew it wide open. With this, the Portuguese charged in, taking the entire garrison by surprise. As the Sawantwadis, who had been concentrating on manning the defenses from the ramparts, rushed down to meet the assailants, savage sword fighting ensued. The garrison proved no match for the Portuguese and those that were not killed were forced to lay down their arms, including the defiant Governor. Even then the bloodshed did not stop. Furious at the casualties they had suffered because of the Sawantwadi refusal to surrender, the victorious troops engaged in vile acts of savagery and mutilation. Even the Viceroy was shocked by the conduct of his men, writing later of ‘acts of the grossest cruelty’. After all the surviving Mahrattas had been 'put to the sword', the Portuguese flag was raised and a cross erected near the gate. 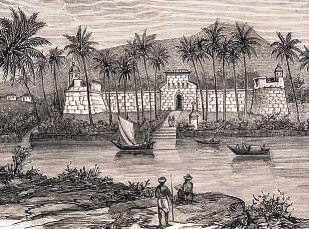 The fort was eventually restituted to the Sawantwadis following a treaty although it returned to Portuguese hands with the consolidation of the New Conquests.